Today, New Year's Eve, I walked all over San Francisco. From Castro to Golden Gate Park down 14th St to the Embarcadero, nearly twice. The second walk was the most exciting. I didn't start it in time to see the fireworks. I saw their reflection off the buildings at the end of Market. I was walking straight into the enormous mass of people who were leaving the fireworks by the Bay Bridge. The mob walked straight down Market. People were setting off big, illegal fireworks in the streets. San Francisco's Finest was suited in riot gear. 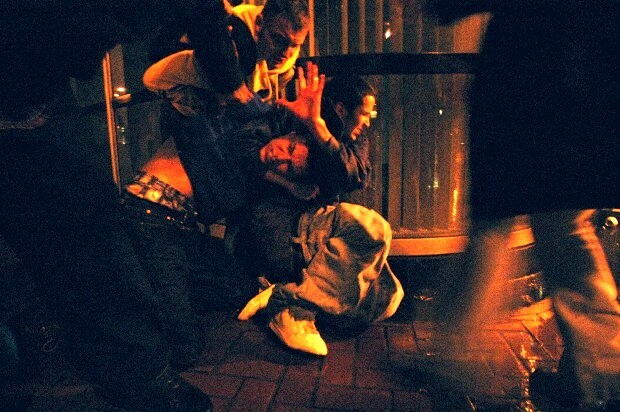 Teenagers were being detained by police all over the city. Teams of officers were running down the streets after perps. Fire trucks were blazing down the blocked off streets. Bottles were breaking all over. "Happy New Year," was shouted in a thousand different voices. Kids were fighting on the side walk. Cars were being pulled over. Trolley cables had to be fixed. The Wharf was cleaned by drones of street sweepers and men armed with brooms and pressure washers. Newspaper boxes had been smashed into cars. Girls were riding home in shopping carts instead of taxis. We danced. And now the city and me are tired.